Sen. Claire McCaskill (D., Mo.) took action earlier this year to make her family's private plane untrackable by the public, according to documents obtained from the Federal Aviation Administration. McCaskill garnered much criticism ahead of her last reelection campaign over her use of a private jet at taxpayer expense, causing her to demand her husband "sell the damn plane." But they bought a new, more expensive plane shortly after she won that election. Now, as she gears up for her next election fight, they have taken action to limit scrutiny of the plane's use. The company hired by McCaskill to operate the plane, a 2009 Pilatus PC-12/47E, wrote to the FAA earlier this year in April to ask that tracking information on the plane be blocked from the public, according to email records obtained by the Washington Free Beacon through a Freedom of Information Act request. Prior to 2013, private aircraft owners or operators had to present a "certified security concern" to the FAA if they wanted to block their aircraft data from public display on websites such as FlightAware.com, where McCaskill's plane could be tracked as recently as this year. However, changes made during the Obama administration removed this requirement and "make the aircraft blocking process as simple as possible." Representatives for McCaskill did not respond to multiple inquiries into the reason for the request and whether it had to do with her upcoming election. 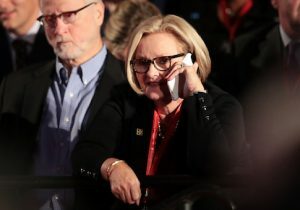 The Washington Free Beacon reported in October that McCaskill had spent nearly $21,000 to use her private plane on the campaign trail in just three months. McCaskill was also spotted using her private plane in August for travel between town halls she held in Missouri, which are events held by her official Senate office. McCaskill also failed to respond to request for comment on those trips. An FAA representative told the Washington Free Beacon it remains uncommon for plane owners or operators to request flight information be blocked, despite the eased process. The plane is owned through TLG Aviation LLC, a business entity held by McCaskill and her husband valued at over $1 million on the senator's personal financial disclosure form for the fiscal year 2016. The campaign payments were made to Aero Charter, a company based out of a small two-runway airport located near McCaskill's home in the St. Louis suburbs that offers an aircraft management service for private plane owners. Aero Charter's vice president for operations wrote the April email to the FAA requesting that flight data be blocked for McCaskill's plane. Aero Charter has told the Washington Free Beacon it was unable to comment on its clients. Donor records from McCaskill's campaign previously revealed it brought in a $1,000 contribution from a top Aero Charter executive as the campaign was directing payments to the company for operation of the plane. McCaskill has already this year been asked questions by reporters about her plane after she said during a town hall that "normal people can afford" to travel by private plane. McCaskill took the comment back during a conversation with the Washington Free Beacon, saying it is "of course not" a normal thing. Republicans dubbed McCaskill "Air Claire" and put footage of her boarding her private jet into campaign ads during her previous campaign.